INDIANAPOLIS (August 25, 2017) – Coming off another fabulous Indiana State Fair and as we approach our annual Fall harvest, I am compelled to write about the culinary and agritourism profile of our state. 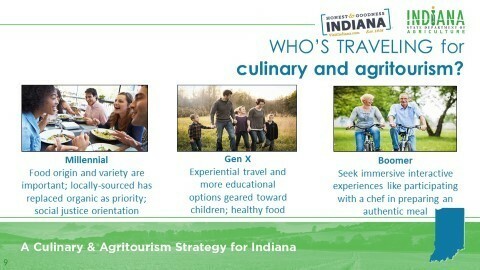 In March of this year, together with the Indiana State Department of Agriculture (ISDA), we unveiled a culinary and agritourism strategy for Indiana: In my view, agriculture has always been the calling card of Indiana. Now culinary and agritourism are bolstering it further. When we talk about culinary and agritourism, we’re talking about food-based and farm-based activities that bring authentic local flavor experiences and working landscape experiences to consumers. We believe that a true powerhouse for Indiana lies at the intersection of these two disciplines, which continue to grow, as does consumer spending. To illustrate, travelers spent $3.2 billion in Indiana restaurants in 2015, part of a record spending year for travelers visiting Indiana destinations. Now, this is spending on food and beverage within the broader tourism industry, not solely agritourism and culinary tourism. But, it gives you some sense for the $11.5 billion tourism industry in Indiana. In addition, ISDA recently compiled a census of farms that engage in some form of agritourism and learned that we have more than 300 agritourism assets across our state. Culinary and agritourism offer some of the greatest upside potential for both our broader tourism industry and for our friends who have a stake in the future of farming and healthy rural economies. The raw appeal of our existing agritourism product and our advancing reputation as a culinary destination, plus the strong overlap with outdoor recreation and heritage tourism make for a powerful combination. There’s a certain reverence when it comes to farming in our state– it’s part of our Hoosier DNA. People want to see and experience life on the farm in an authentic, meaningful way. Given our rich agricultural heritage and the rise in demand for experiential travel, we at the Indiana Office of Tourism of Development (IOTD), along with our partners at ISDA, recognize the tremendous growth potential here and believe our state is uniquely positioned to deliver those experiences. Plus, growers and producers want it, so do farm direct sellers and marketers, as well as those who have a particular interest in seeing rural Indiana flourish. That’s why we developed the statewide culinary and agritourism strategy. We want to support product development activities undertaken by individual agritourism operators and regions throughout the state, which fulfills our mission of economic impact by helping these businesses form, grow and thrive. We also want to deliver resources, education and marketing to help producers reach a broader audience and tell their story in a new and exciting way. All of this, when fully implemented, will lead to a stronger, healthier rural economy. To succeed, we need to draw more people into these industries and bolster the ones that are already there. We want to own our agricultural roots. We want to take the farm-to-table lifestyle that we’ve been living for generations and use it with more intention to drive visitors to our destinations. It’s our vision to make Indiana the center for culinary and agritourism best practices and a destination for unmatched food and farm-based experiences. We now have the blueprint to make that happen. To explore culinary and agritourism on Visit Indiana website, click here. For operator resources on the Indiana State Department of Agriculture website, click here.